A new project was begun the other day. My first step was to over-paint this crayon rubbing made a number of years ago. I had created this rubbing on a metal grid of a patio table with the intention of making rippling water in a future quilt. I used the flat side of the crayons and made big sweeping horizontal strokes. Here I'm set up with my plastic drop cloth, fabric paints, sponge brush, and pie tin pallet. I put dabs of paint, one color at a time, onto the pallet then poured a bit of water into it. I used whole arm sweeping horizontal strokes to apply the paint. The brush wasn't cleaned between colors. fabric on which there was more of a resist to the wax . The smaller piece won't be in my new project, but added to my stash. To read of other crayon rubbings I've made for quilt projects go here. These are just a few of the 93 quilts in the show that ends today. They're the ones that caught my eye and I had my camera at the ready. Some of them are new ... some have history. That is the quilt being delivered to the show when I submitted my entries. Our Mayor Eddy Ford's baby quilt made by his grandmother and aunts. A friendship quilt made for a Philadelphia, Penn. girl's 16th birthday in 1891. Owned by Elizabeth Jamison. Seeing all these quilts featuring sunbonnet Sue and sweet Sue together, I just had to take a picture. This man apologized for walking into the photo. I was pleased to see quite a few men at the show, including my own husband. Quite a few of them were making the rounds on their own. The above quilt is based on the Civil War themed show performed by the Farragut High School Band during the fall of 2004. Machine pieced and quilted, the quilt consists of b&w as well as colored photos taken by the maker. The photos were blown-up or reduced, printed on fabric and then cut and pieced with cotton fabrics in the colors of blue (North) and grey (South). The design is based on a formation used in the band drill charts for the show. The quilt includes alphabet charms, various button, guitar picks, clarinet reeds dyed with black ink, a guitar bridge and guitar string knobs. PS: This concerns the web cam for the channel on Lake Michigan that's in my sidebar. If you see large equipment with cranes and stuff, the Corp of Engineers is pumping sand out of the channel to prepare for the shipping season. This year the public beach on the north side of the channel gets that beautiful, clean, fine sand. Last year it was pumped on our side. The tenth biennial for this show is taking place in the Farragut Town Hall through Sunday. Ninety-three quilts are hung and draped in the rotunda, auditorium, hallways, and side rooms. It is not a judged or juried show. If a quilt was award winning in another venue, it's ribbon is displayed with it. 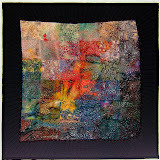 Linda Roy is the featured quilter. 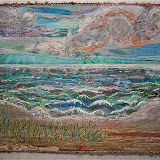 Eight of her national/international award winning quilts are the center piece of the show. A number of which have appeared in calendars and magazines. It gives me goose bumps seeing that many of her exquisite quilts in one place. 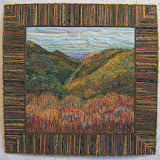 Linda is a fellow member of the Smoky Mountain Quilt Guild. As far as I know, she only makes big bed-sized quilts. 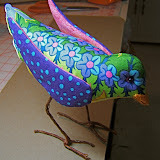 All her work is hand applique on machine pieced backgrounds. 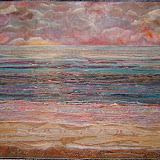 Linda's hand quilting of the tiniest stitches is composed of originally designed intricate patterns that are dense. 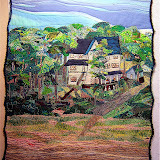 Following are photos of Linda's quilts. And here I am with my four entries. Of course, you recognize the newest one. 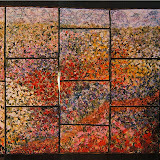 "Silk Roses" and "Moon Dance" were award winning quilts in SMQ 2007 show. That's "Lake #52", the only official one of the series I've made this year. My next post will feature other wonderful quilts on display ... some new, some not so new, and some really old. 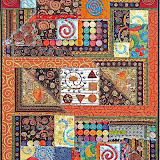 "Come With Me to the Kasbah"
My journey with this quilt began with a collection of seven blocks featuring spirals that were made for me by Thursday Bee members of the Smoky Mountain Quilt Guild. The resulting combination of them with my block and fabrics reminds me of being in a North African kasbah at night ... the exotic confusion of lights, the wares displayed in the souks and the many twists and turns of the alleyways. The spiral is one of the oldest symbols and much used in North Africa. Here's the back where a great deal of hand-stitching of the strips of fabric over every seam plus four vertical ones supporting the length was done. The colored blocks are the bee exchange ones. And here's a detail shot of the edge finishing on the front of the quilt. ... and on the back. It's the usual double fold binding technique. I allowed for a 1/2" width on the front and a 2" width on the back for added support to ensure that the edges wouldn't curl either to the front or back when it hangs. I appreciate all of you who have followed the process of my designing this quilt and a big "thank you" to all who left comments. It is one of the most complex quilts I've ever done because it started with that diverse collection of blocks rather than what I would've chosen from scratch. Here are the links for the steps taken to get it completed. "My Blocks In the Bee Exchange"
"By George, I'm Getting There"
"Can't Believe What I Did"
I just delivered this quilt to it's first show, "2008 Festival of Quilts", the 10th biennial show in the Farragut Folklife Museum. The show runs fron March 27 th thru the 30th. 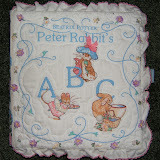 I thought you'd like to get a closer look at the details of the seams and embellishments on this quilt. Beads, sequins, and spiral springs have been sewn onto the surface of the quilt this week. The spiral shaped paper clips were stitched on individual pieces before constructing the top. All photos are clickable for an even closer view. Note the "spill" of beads scattering into the dark side of the blocks on each side of the center section. The painted and stamped red strip in the photo below is from a piece of fabric gifted to me by Arlee of Albedo Design Journal. The day that it arrived I was struggling to get this upper left corner section of the design to work. It was just the right color and pattern to fill in and work around to make that happen. It appears in two other places to carry through with repeating elements. I was too excited and busy working Arlee's fabric in that I didn't snap a photo of the whole piece. I used all but about a square inch of it. Sequins with metal beads and the springs added to the bottom section of the quilt. The silver was painted onto a B&W circle/spiral batik fabric to carry through what I had done to the background of Sheila's block. Now to clear off my cutting table so that quilt can be squared up. My next step is binding it, adding a sleeve, and the making the label. Whew! This quilt has demanded much more work and time than I imagined it would. Thanks to all who left comments for your input. It's interesting how everyone is visually tracking through this composition. It gives me pause about the power I thought I had in guiding "the eye" within my work. Well, at least everyone's eyes are staying within the "picture" and doing a bit of exploration. A very good thing! As most of you know, a photo doesn't duplicate the actual colors. In reality the yellow beams like a light from this quilt, whereas, the orange beads in the "butterfly tongue" spirals in the center section shine more brightly in the photo. Also, the focus block is sparkling white because of the dark contrasting shapes on it as well as surrounding it. The light valued blues are quite true in the photo. In the black and white version below those orange beads disappear. A "rule of thumb" I have for keeping attention within a piece is to arrange a visual sweep from upper right diagonally to the lower left. This counteracts our natural tendency to read patterns from left to right ... and on out of the picture. For that same reason I have strongly featured border patterns in that lower left corner to block the exit and draw your gaze back to the bright colors in the quilt. Speaking of the border patterned fabric, I have used it around the outside edges to loosely frame the composition. It's also been used on the interior to transition between sections OR to guide the eye from one area to another. Below is a tracing of the lines and shapes within this piece ... squares, rectangles, and triangles. And here's a tracing of all the spirals. To my eyes, both look balanced and have a good distribution of the shapes. There are a number of ways that attention may be attracted to an important area of a design to give it emphasis. As a general rule, a focal point is the result of one element differing from the others. This piece is essentially an overall pattern consisting of spirals on a foundation of geometric shapes. The one element that is the most different is the centrally located block. There are a number of factors that contrast it to all the other blocks. As much as that focal block has going for it, it was a challenge to not detract from it with the other fabulous round robin blocks that I was committed to use in this composition. Segmenting five of them to make repeating colors and patterns made it easier. 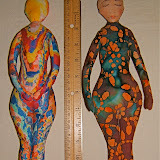 Adding paint to two others helped blend them into the mix. All the other background pieces were chosen or created to fill in or to support/balance the whole design. The block with the medium-light aqua deconstructed spiral on a bright yellow background was my primary concern. The cut up pieces are placed diagonally to draw your eye through the center of the quilt. I'm grateful there are yellow stripes in that center focal block to carry more smoothly across it. Even without the stripes my intention would work because yellow and white are so close in value. I also added spots and strips of yellow throughout the composition to balance and support that sweep of brightness across the quilt. To counteract/balance that strong diagonal flow of color there is a definite diagonal patterning that crosses it between the other two corners. 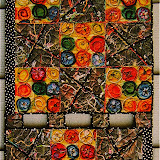 The result is in an "X" through the quilt with the focal point in the visual crossover. There is also a strong horizontal pattern created by the frame around the center section. I've also kept most of the brightly colored small circle/spirals in the vertical center of the composition. These vertical and horizontal patterns form a cross "+" through the center. In effect, this is a radial composition. However, it's not "read" the way a usual radial pattern is seen ... multiple elements pointing to one item. My eyes focus on the white center block first, then are drawn up the yellow path to the upper right corner, back to the center top by the orange and light blue, then they follow the brightly colored circles down through the center to the bottom edge of the quilt. The two lone circles and the bright, light blue just to the right attract my attention to make me linger a bit before the strong yellow pulls my gaze to the bottom left corner and then back up to the white block in the center. I haven't meant to dictate how this piece should be "read". However, I'm curious to know if your eyes follow different paths from mine.